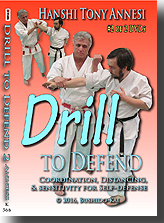 3 DVDs, 6 hours of traditional karate with an iconoclastic approach! Note: Downloads available one part at a time (see below). 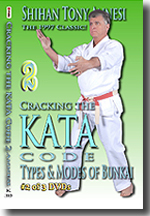 You know how to perform your kata but do you fully understand them? 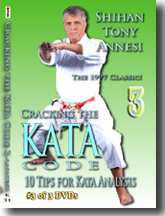 From the ground-breaking book of the same name (see book section), Shihan Tony Annesi reveals how kata is misunderstood by most practitioners, both modern eclecticists and traditionalists. There are two ideographs for kata. One implies a rigid mold, the other suggests a general shape — "the mold filled with gelatin." As a beginner you were instructed to follow the rigid mold, but did you learn how that rigidity becomes softened by interpretation and personal sensibilities in more senior practice? 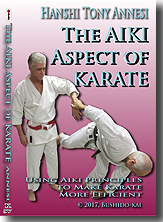 Annesi offers the details of a 3-tier approach to kata study. 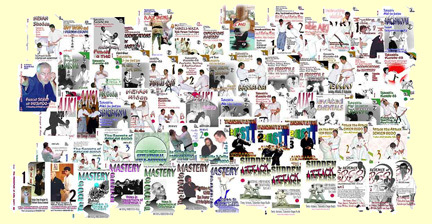 Chojun Miyagi said, "Kata are not simply an exhibition of form; they are concrete manifestations of techniques that can be transformed at any time to any form at will and in which the essence of karate has assumed a definite form." • "A Preview of Coming Attractions"
Kata Code 1Are you the unusual student who can see beyond the surface? 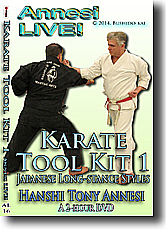 Bunkai means sample, example, or analysis. A method of analysis that reveals unexpected techniques and principles is the subject of this and the next video. Sometimes bunkai reveals overt oyo (applications) but, in other cases, these oyo are intentionally indistinct, even barely suggested. 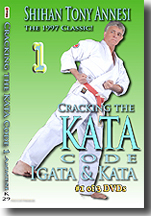 Kata are like great books -- what they offer is obvious but there are multiple layers of meaning that only a talented teacher or student can reveal. • "The Randori of Juho Kata"
• What Type & Mode Is It? Test your interpretive talents. 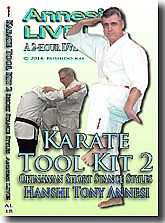 Shihan Annesi suggests 10 simple guidelines that can help martial artists get the most from their kata study. He uses an unusual kata, Aragaki Unsu (Cloud Hand), to demonstrate the ideas previously taught. 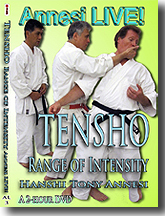 Both students and Shihan Annesi contribute to the possible interpretation of the material covered, exemplifying an approach both very traditional and simultaneously ground-breaking.